Don’t Miss Your Chance to Explore Campus! Only 26 days until the first Undergraduate Admission Fall Open House of 2013 at Loyola University Chicago! This year’s Open Houses will take place on Saturday, November 9th and Saturday, November 16th starting at 9:00 a.m. Many students & parents have been asking questions about the event, so hopefully this post will provide some answers! Open House is an opportunity to explore campus, tour the residence halls, learn about academic programs, find out about admission and financial aid, and connect with current students and faculty! There will also be presentations on experiential learning, residence life, study abroad opportunities, pre-health advising, and the new Institute of Environmental Sustainability. Click here for a full schedule. Who can attend Open House? High school juniors & seniors, transfer students, and their families are invited to attend Open House. Click here to register online! Do I need to bring anything to Open House? You are not required to bring anything to Open House. Though we do recommend that you spend some time looking at the schedule before hand so you can select which sessions you would like to attend. Also, be sure to come prepared with any questions you have for admission counselors, financial aid counselors, or faculty members from your major/program of interest. Do you have hotel recommendations for the weekend? Yes, click here for recommended lodging options nearby. Is parking available on campus? Yes, we recommend that all visits park in our main parking structure on campus. Parking will be free on both Saturdays. If I cannot attend Open House, is there another time I can visit campus? Yes, you can attend a campus visit at our Lake Shore Campus on Monday – Saturday and our Water Tower Campus on Monday – Friday. If you have any additional questions, give us a call at 800.262.2373 or email us at admission@luc.edu. One of my favorite parts about Loyola is the number of opportunities for service that are presented to the students. Being a service-oriented person, I have always been drawn to that aspect of my school. When I was a freshman, I signed up for an organization called Loyola 4 Chicago. What I didn’t know then was how involved I would soon become. Loyola 4 Chicago (or L4C) is a service-based group that runs through the Center for Community Service and Action. Students sign up for a semester-long commitment, and L4C sends them to various volunteer sites throughout the Chicago area. 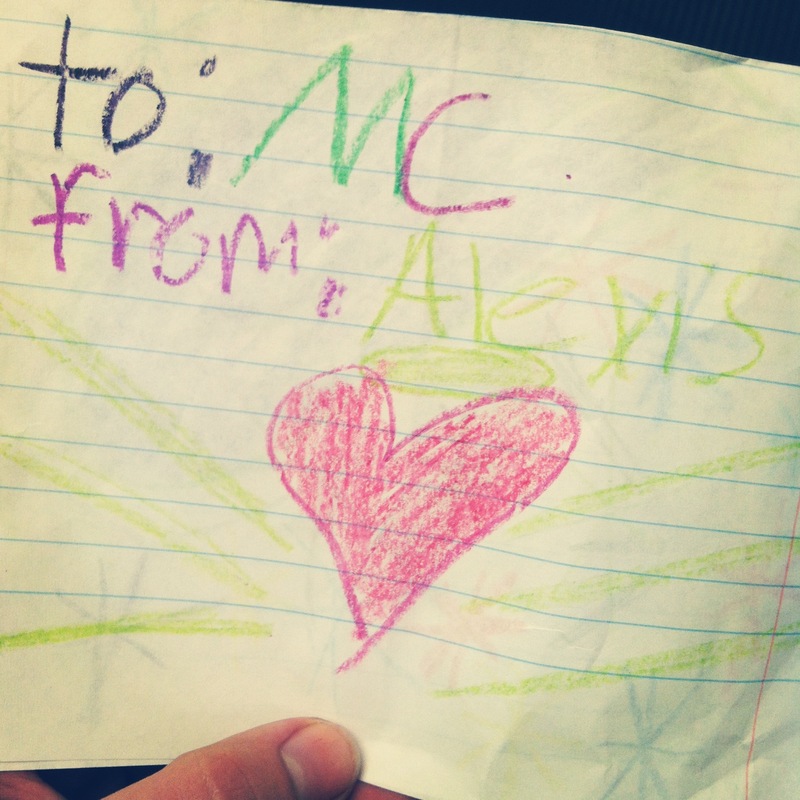 I have volunteered as a tutor in three different locations since I joined L4C. But my experience this year is unlike anything I’ve ever done before. Currently, I’m volunteering as a tutor at Chicago Hopes, a non-profit organization that aims to serve the homeless children in Chicago. Unfortunately, the average age of a homeless person in Chicago is 9. Consequently, the people at Chicago Hopes have their work cut out for them. Chicago Hopes works in various homeless shelters throughout Chicago, though I have been working for one in Uptown called Cornerstone Community Outreach. Located just off the Wilson Red Line, Cornerstone shelters homeless men, women, and children. Chicago Hopes comes in every day to offer an after school program for the children staying in the shelter. I have been working with a second grader named Alexis. She may be small, but the girl is bursting with personality! I usually have to remind her to start on her homework, because I think she would be perfectly content to just sit and chat for our entire two hour session. Even though we’ve only worked together a few times, she is already talking to me like we’re old friends. Chicago Hopes has been my first volunteer experience with the homeless, and easily the most rewarding. I am humbled by the life and spirit that I’ve seen in these kids. Without the stability of a physical home, I can only imagine how difficult it must be to focus on an education. Yet the children of Chicago Hopes show up everyday ready to work. And the motivation in the students is a clear reflection of the Chicago Hopes staff. The entire organization is run by volunteers who have a vested interest in the lives of these children. It is through their hard work and dedication that the organization continues to grow. I would encourage anyone looking for service opportunities to take a look at Chicago Hopes. Its name truly does it justice. If there is one thing you can count on, it is that the weather in Chicago can change at the drop of a hat. It can go from scorching heat to frigid cold in less than a week. Consequently, the people of the windy city need to take advantage of the nice weather while it lasts. The students of Loyola are no exception to this rule. 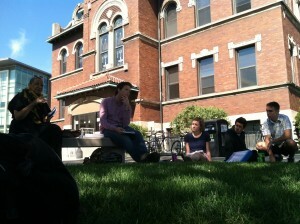 Lucky for us, some of the professors are just as eager to soak in the last bit of sunshine. Ayana Karanja, my professor for SOCL 252: Global Inequalities, took our class outside last week for lecture. Despite a few confused stares from onlookers, and the ever-present sound of Loyola construction, I would say that taking the class outside was a huge success. A change of scenery breathed a new energy into our class discussion on social issues, and being seated in a circle on the grass made it easy for everyone to contribute. I consider myself lucky to be enrolled in classes such as Global Inequalities, where it is easy for professors like Dr. Karanja to mix things up every once in a while. I think the most effective professors are those that make the learning environment as comfortable as possible. That combined with Loyola’s relatively small class sizes has made my learning experience in college especially valuable. So as I look forward in the semester, knowing that another Chicago winter will surely come with a vengeance, I am glad to know that a few more weeks of warm breezes and sunshine still remain. 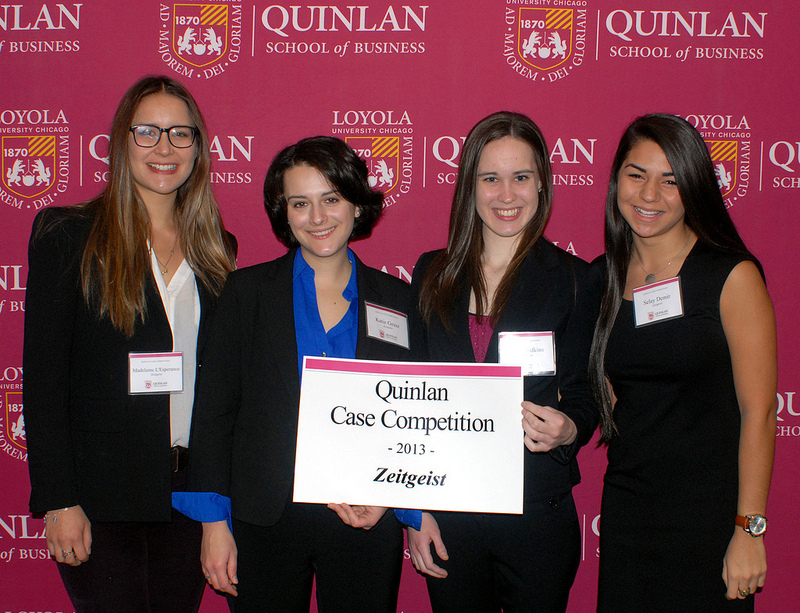 On October 7, 2013, Quinlan School of Business hosted their second annual Case Competition. The competition was open to all undergraduate students majoring or minoring in business. Students worked in a team of 3 to 5 in which they were given a real-world business situation and were asked to present their solution to a panel of judges. The top three teams won cash prizes. Shown in the picture above is Zeitgeist, the team who won first place this year. In the fall of my junior year, I took a plunge and applied to a new program offered at Loyola University Chicago. To my surprise, I was accepted and my Loyola experience took a turn I was not expecting. The McNair Scholars Program was named after the academic achievements of Dr. Ronald E. McNair, a physicist and one of seven crew members who perished in the 1986 Space Shuttle Challenger disaster. Established by the U.S. Congress in 1989, the funding for this program is designed to increase the number of low-income, first-generation and underrepresented college students who pursue and complete doctoral degrees. One component of the McNair Scholars Program is to conduct a summer research project under the guidance of a faculty mentor. When thinking about how I wanted to go about my summer research project, I made it a point to try to fuse my interests in journalism, media studies, anthropology and international studies to use. When reflecting on my research experience this past summer, I think of it as peeling off the layers of an onion. Every macro idea revealed many micros that could not be explored in nine weeks. But, why did I spend time behind the computer exploring the “virtual world” that is New African Social Media? The advent of African youth having the space to show creativity and to share it through virtual communities hits home. Producers are able to communicate and share what they believe Africa was like in the past, what Africa is like in the present and what Africa will be in the future. New African Social Media is an example of how new forms of media impact culture. Those within this “virtual world” are able to re-appropriate content and attach new meaning to the content they create or share. With this, it was interesting to unpack how this content differs from Africa-content material in mainstream media. New African Social Media allows producers and consumers to shed a different light on what Africa means and is to them: diverse, progressive, and positive. People are given the freedom to be bold to create, report, and share what they do not see in mainstream media; as well as to give a more balanced view of what occurs on and off the continent. So far in my research I have found that people most popularly share visually contextual content that depicts people, daily life, and women. The peeling of this onion continues as I unpack the why, how, where, and when of these findings. Although my summer research portion has finished, I am grateful for the opportunity and time to continue my project as an independent study with my faculty mentor this semester. The next step in this program is the graduate school application process. Alongside conducting research, my cohort and I were given opportunities to attend conferences off campus, to visit graduate schools that work with McNair Scholars and to become familiar with how to go about submitting applications to programs that we are interested in. Although the stress of applying to graduate school is prevalent, I find comfort in the support of the McNair Scholars Program I have received thus far. This summer was an eyeopener for so many greater things I can accomplish as a scholar. It’s already October! Which means that it’s time for fall break! We are lucky at Loyola because not all schools have a fall break. Fall break is essentially a four-day weekend because we get Monday and Tuesday off. A lot of students will take this time to go back home or visit friends else ware. I am going back home to Michigan tomorrow (Friday) afternoon, after classes. I get home around 4:30 and then I am heading over to Ann Arbor Michigan with a couple friends from home for the University of Michigan’s football game on Saturday. Thanks to our Indian summer the weather is supposed to be mid to high 70’s and partly sunny. Pretty ideal conditions right? After the football game I will return home and spend some quality time with my family and, unfortunately, with my schoolbooks. I have four midterms next week so even though it will be a short week, it will be a very busy one! 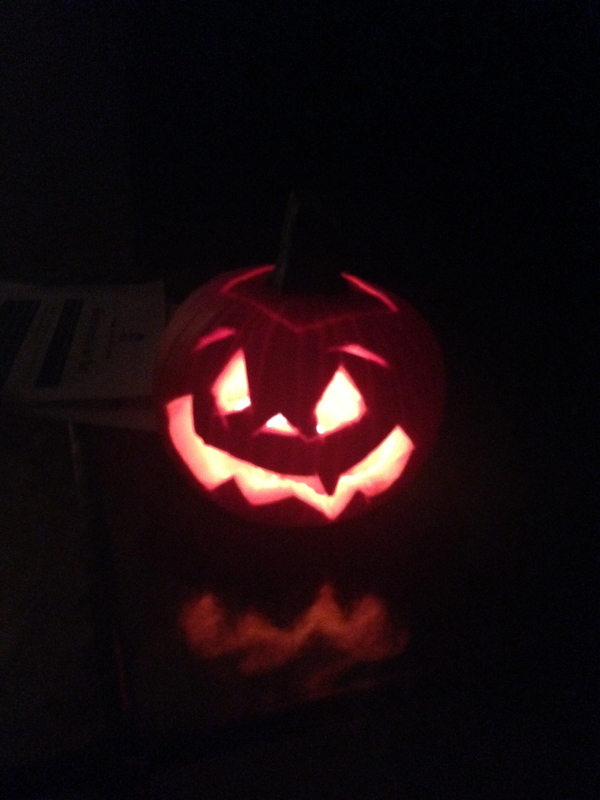 In the spirit of fall break, and of fall in general, I carved a mini pumpkin tonight! Well, to be honest it was more in the spirit of procrastinating homework and pulling a prank on my roommate who bought the mini pumpkin for a table decoration, but it celebrated fall just as well! It’s stressful and it can be overwhelming, but deadlines are the framework of the college admission process. Every step in the cycle revolves around the next deadline. If you are reading all of the brochures you picked up from a recent college fair or online via a school’s website, you’ll notice that every college or university seems to have a different admission and scholarship process and yes—even different deadlines. Probably the best way to wrap your mind around all of the different requirements and dates will be to put it all on paper. So go ahead and pull out a sheet of poster board and tack it up in your room or set up an Excel spreadsheet that you can refer to throughout your college search process. List the schools you will apply to and leave room for a few more you might consider later. When is the application deadline? What do you need to request from a teacher/counselor/registrar? What is the scholarship deadline? Visualization is an amazing trick. Believe me—it will help. It may seem like it, but college admission officers don’t get together to try to confuse the process or add to your stress during your senior year. It is really just a matter that each school operates differently. We all have different committee review processes, admission criteria, admission decision dates, and ways that students can be considered for scholarships. In the end, the deadlines help us to help you. By meeting the appropriate deadlines for each school, you put yourself in the best possible position for admission consideration and potentially, scholarship consideration. Once admitted, you are also set up to receive additional information on majors, clubs and organizations, residence life, financial aid, additional scholarships, and more. All of this is in support of giving you an opportunity to drive the rest of the process. You see, the tables turn once you are admitted. From this point forward, admission officers are waiting to hear from you. So take time to visit each campus, sit in on classes, talk with students and faculty, and attend an open house or admitted student event. I invite you to get organized if you haven’t done so already. Attack the deadlines, don’t fear them! Will Loyola be your college “best fit?” Will you be part of our Class of 2018? The first step in finding out is to complete your application by the December 1 Priority Deadline. Doing so ensures that you have the best admission and scholarship consideration. Today was the 11th annual Wellness Fair which took place from 1:00pm -4:00pm in the Damen Student Center. Students were able to get free flu shots, free massages, and even free manicures!